We’ve jumped past Leap Day — and its sales — but that doesn’t mean the savings have to end. Popular intimates and apparel store Victoria’s Secret is hosting a sale that will have you pulling out your credit card once again. 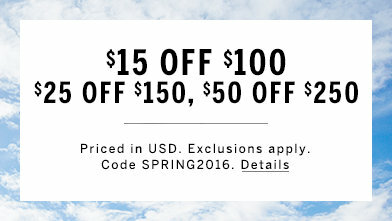 For a limited time, shoppers can take $15 off $100, $25 off $150 and $50 off $250. Simply enter promo code SPRING2016 to have the savings applied to your eligible purchase at checkout. This discount is available through 11:59 p.m. Pacific time on March 3. Some exclusions apply; see the retailer’s website for full details. For more tips and tricks on shopping at Victoria’s Secret, check out our Victoria’s Secret Store Guide and Victoria’s Secret Semi-Annual Sale and Events Guide.